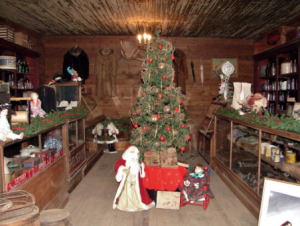 Saturday, Dec. 1 – Holiday Open House at the Buffalo Bill Center of the West. This memorable day at our world-renowned museum includes inspired holiday decorations throughout all five museums, live entertainment, music, dance performances and carolers. The museum is collecting food, toys and pet care items to donate to a variety of local charities. 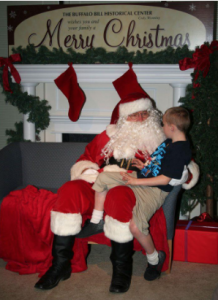 The big guy delights young visitors during the Buffalo Bill Center of the West holiday open house. 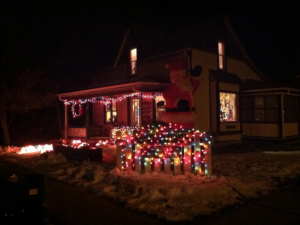 Sunday, Dec. 2 – Country Christmas Tour of Homes in Powell, Wyo. This fun and festive event includes trolley tours of some of the most beautiful – and beautifully decorated – homes in town along with festive appetizers and drinks. Meeteetse’s historic downtown buildings are beautifully decorated during the holiday season. Saturday, Dec. 15 – Christmas in Meeteetse in Meeteetse, Wyo. This special event includes a local artisan’s craft fair, food specials, marshmallow roasting, story-telling, entertainment, community dinner and lighting of the Memory Tree. Whenever I’m in Meeteetse, I always stop by Tim Kellogg’s Meeteetse Chocolatier for some holiday specials like eggnog truffles and candy cane bark. The saloon at Old Trail Town features old-fashioned decorations. Until next time, I’m making my list and checking it twice here in Cody Yellowstone.